While I was back in Melbourne I enjoyed catching up on few of the decor magazines that I don’t buy regularly here in Hong Kong, namely House & Garden. 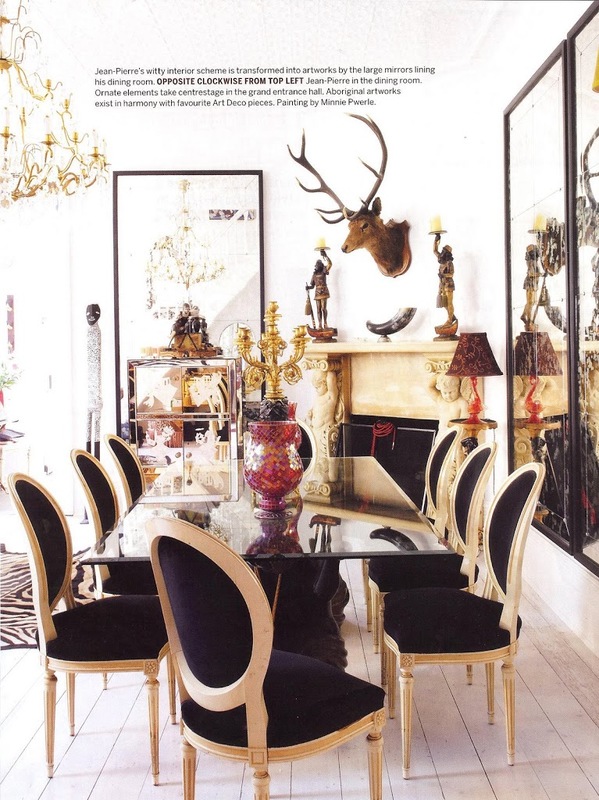 One spread in particular that caught my eye was the home of the Melbourne-based French interior designer, Jean-Pierre Heurteau. If you remember, he is the designer behind those glossy black floors in a previous post. He is such a character in real life, so it was so great to see a home of a designer that I’ve actually met. His home is so full of life, colour, and well – flamboyance, that is enough to make any minimalist sick. But I love that he has been true to his personality, and has somehow managed to blend Australian and French cultures together – not an easy task! As you can see he’s used an all white palette for the background and layered it with pieces of different eras and cultures – and so many colours. 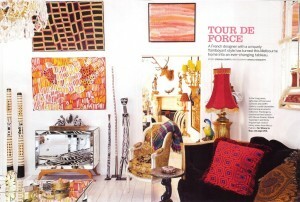 Who knew that Aboriginal art would look so fabulous with French antiques? 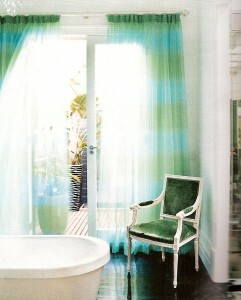 With all those reflective surfaces and silk damasks it would feel like you were living inside a jewellery box! 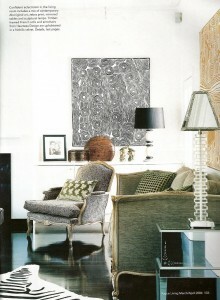 All photos by Shania Shegedyn for Australian House & Garden magazine, May 2009. Yesterday’s post on gardens had me thinking of all things green, my favorite colour, and made me remember this Melbourne home that I had seen some time ago. It was decorated by another of my favorite Australian designers, Jean-Pierre Heurteau (he’s french, in case you can’t guess from the name!). I was fortunate enough to meet him once when I was living in Melbourne, and he is quite a character. The owners of this home had just returned from a trip to the US – including a stay at Kelly Wearstler’s fabulous Viceroy in Santa Monica – and after finding a copy of her first book they were inspired to re-create that Hollywood glamour look in their own home. They knew that Jean-Pierre would be the best person to do that for them. This home is a typical victorian-style townhouse that you find a lot of in Melbourne, but which are being gutted or having the backs chopped off to ‘modernize’ them. Personally, I think if you want a modern home you should just go build one and not destroy history, but that’s just me. Anyway, I love what this couple has done to theirs, they’ve opened it up a little, but it seems to be a sympathetic renovation, and the decor is perfect. 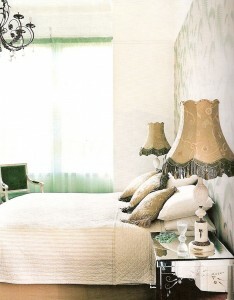 The colour combination of mainly white, green and a little black is so fresh. I love it. The owner with family pet standing in the hall. 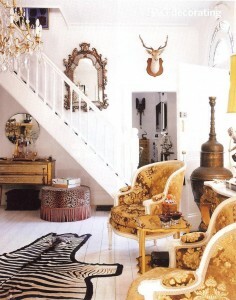 I love the contrast between the glossy black floorboards and the white walls. It’s super airy and light, looks modern, but they’ve kept all the original mouldings. 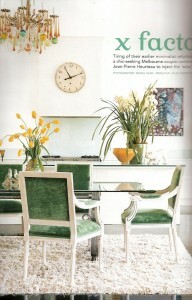 Love the green chandelier and the mirrored console behind. 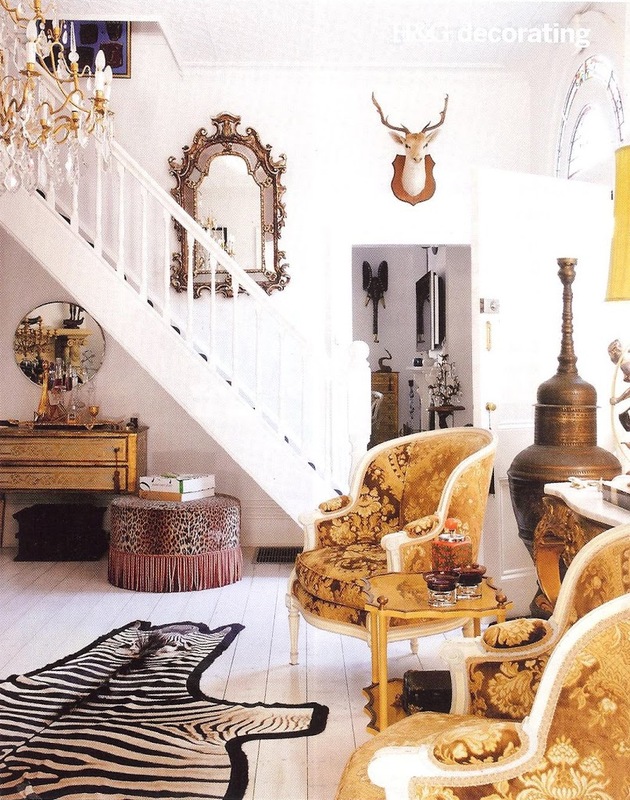 In the Living Room, Jean-Pierre has tried to keep the high-glam to a minimum so that it still feels comfortable and livable. The open dining/kitchen area is beautiful. I love the green velvet on these chairs, and how it picks up ever so slightly the green from the glass splash-backs (hard to see in this photo, I know). The multi-coloured murano glass chandelier above is just amazing. Two views of the master bedroom. 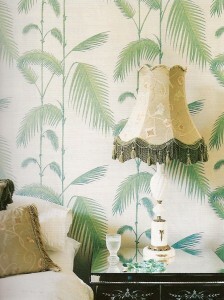 Feature wall covered in a wallpaper from Cole & Son. Lamps, cushions and other accessories from Jean-Pierre’s shop. Two views of the master bathroom (with a mirrored dressing room barely visable to the right). I would kill for an open bathroom like this. As you can see from the lower image, it opens out to an internal courtyard. The perfect place to sit and soak and unwind after a long week. 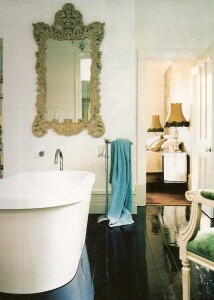 Just need a small table beside that tub to rest magazines and a glass of champagne! 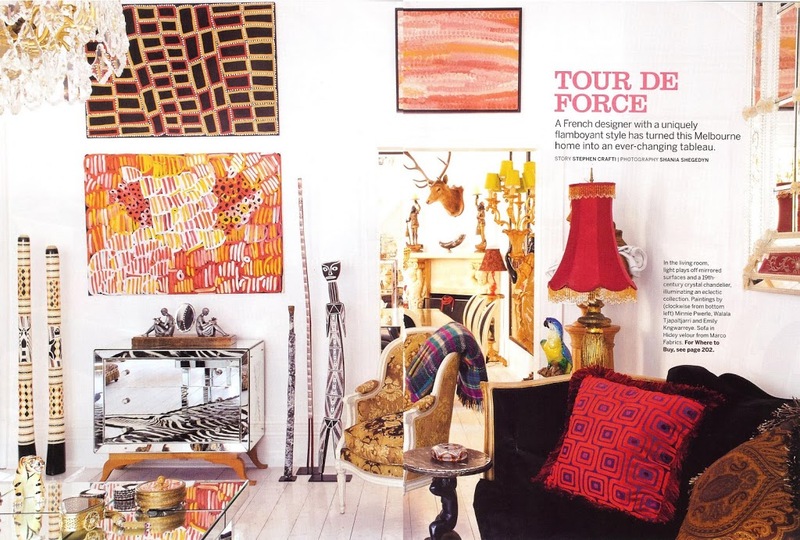 All images from Vogue Living (Australia) March/April 2006.